The Si5351A VFO/Signal Generator kit has a rotary-encoder tuned output, and a separate independent fixed (configurable) output. Both outputs have a range of approximately 3.5kHz to 290MHz. A GPS receiver can be connected to maintain precise frequency output. The VFO/Signal Generator kit includes a Si5351A synthesiser module kit and rotary encoder. Optionally it can also be used with the OCXO/Si5351A synthesiser kit. The kit supports the full output range of the Si5351A, which is 3.5kHz to 200MHz according to the datasheet (but appears to work fine up to 292MHz, though who knows with what other consequences). The outputs of the kit are SQUAREWAVE are 3.3V peak-peak. The QRP Labs LPF kit can be fitted optionally to produce a sinewave over a relatively narrow frequency range. There is PLENTY of program space in the processor and it is expected that functionality will be expanded in future firmware releases. So please email your suggestions! Printed instructions are not supplied with the kit! You need to download them here. You need THREE manuals, and to choose the version appropriate to your PCB and firmware version: the Assembly manual, the Operating manual, the Si5351A manual. Assembly instructions VFO kit, PCB "QCU Rev 1" or "QCU Rev 3" or "QCU Rev 4"
AN001 and AN003 are written for the Ultimate3S transmitter, but they also are relevant to the VFO kit. Version upgrades can be purchased at QRP Labs or you can upgrade your own firmware using the .hex file from the Yahoo forum. The kit contains the PCB, back-lit blue LCD, programmed microcontroller and all board-mounted components, rotary encoder, and 4-way ribbon cable. It also includes the separate Si5351A synth kit. Download the instruction manuals using the link above. The PCB is quite compact and care is required in the construction. The Si5351A Synth in the VFO/SigGen kit produces a squarewave output. Starting in firmware version s1.03 the processor can control the 6 relays in the 6-band Relay-switched LPF kit. This feature can be used to automatically select a LPF depending on the VFO operating frequency, to optimally remove the harmonics and leave only a nice high quality sinewave remaining. If you require a general purpose HF sinewave signal generator then this option could work well for you. 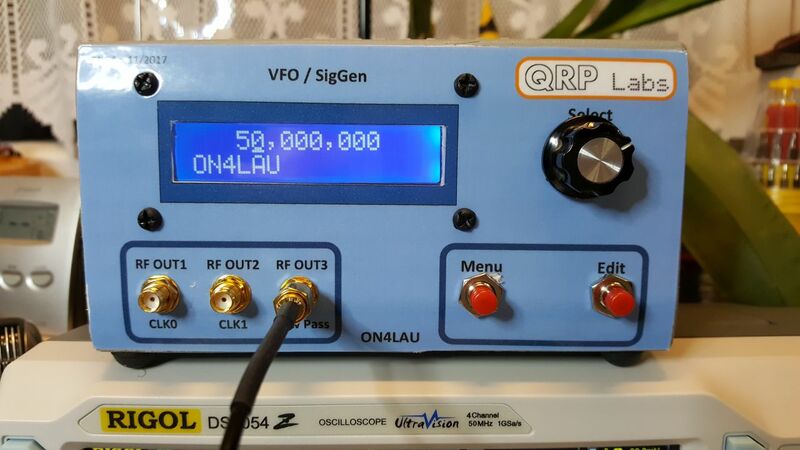 The combination of VFO/SigGen kit with relay-switched LPF kit and six LPF kits for 60, 40, 30, 20, 15 and 10m produces a good quality signal generator. This is described in App Note AN006. Click for larger versions. 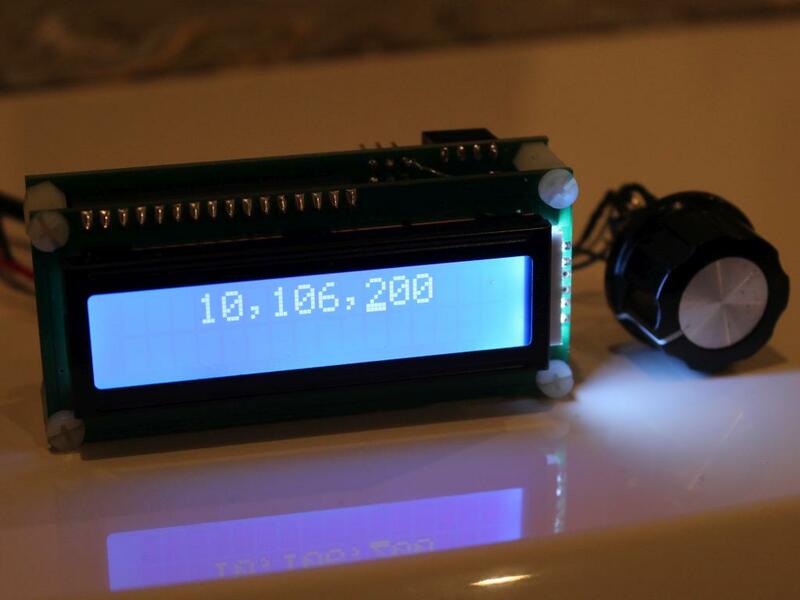 Note that the rotary encoder IS included with the kit, but the plastic knob pictured is NOT part of the kit. It is available as an optional extra. The 'scope screenshot shows the quadrature output mode using the Clk0 and Clk1 outputs. The graph is measured unwanted sideband suppression in a 40m CW transceiver, using the quadrature mode (RED line) vs using a 4x VFO and 74AC74 divider (BLUE line) - demonstrating that the quadrature output of the Si5351A is accurate. Note that the minimum frequency for quadrature mode is approx 3.2MHz, this is a constraint of the Si5351A chip architecture. 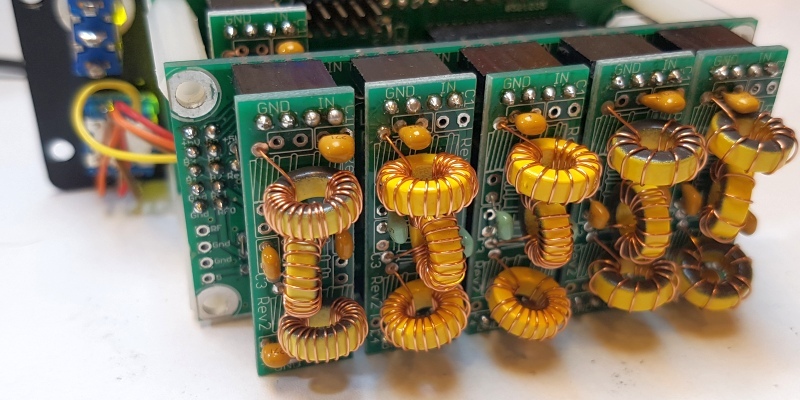 This nice article by Gwyn G3ZIL compares the performance of a direct conversion WSPR receiver using a QRP Labs Si5351A Synth as LO, to a crystal oscillator. 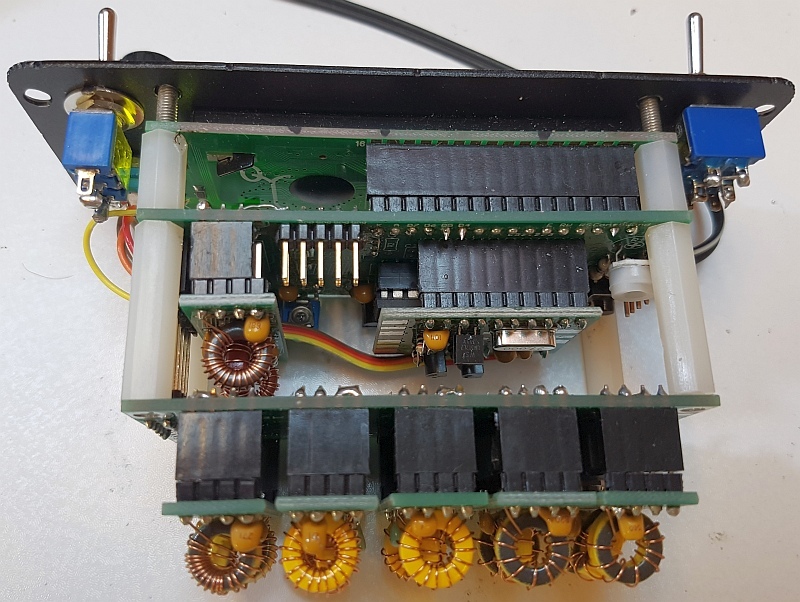 The results are favourable, and also show the importance in some situations of ensuring a good low noise (no mains hum) power supply for the Si5351A. An enclosure kit is available consisting of a black anodised aluminium case, cut, drilled and printed to match the VFO kit. The kit also includes a pack of accessories, containing buttons/switches, connectors and mounting hardware. Please see http://qrp-labs.com/vfobox for details. The U3 Box is compatible with the VFO/SigGen kit. 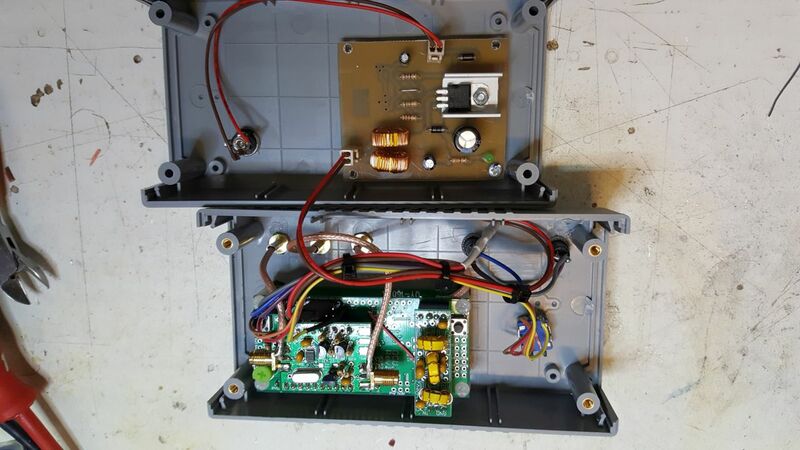 See this nice example by Larry KB3CUF, who uses his VFO as the LO of the QRP Labs receiver kit. The BITX40 radio has an analogue VFO. 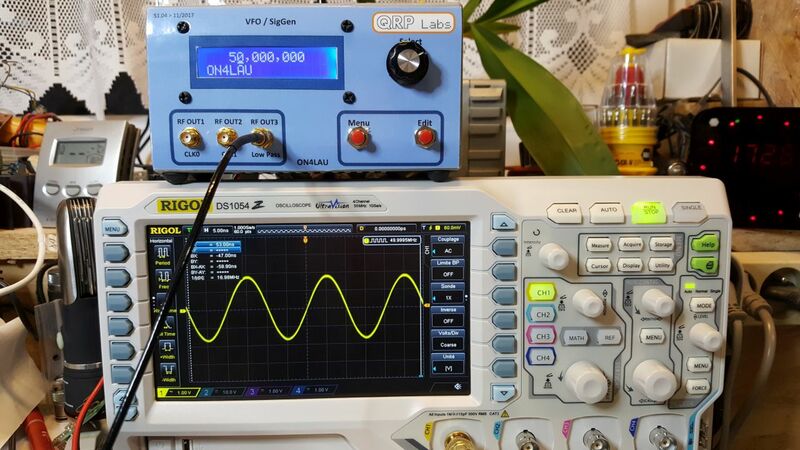 The desiner of the BITX40, Ashhar Farhan VU2ESE, recommends the QRP Labs VFO kit for use with the BITX40. The BITX40 PCB already has a 2-pin header labelled "DDS1" for use with an external VFO. All that needs to be done is to connect ground and the VFO kit's Clk0 output to this 2-pin header; then cut out L4 from the BITX40 (to disable the BITX40's onboard VFO).